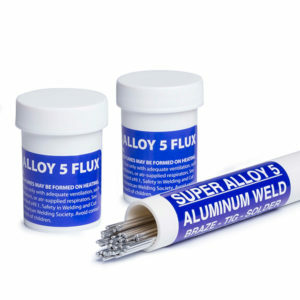 First, wire brush your aluminum to remove the oxides, then broadly heat your base metal and add your flux with the torch. Only add your rod after the flux has done its job by opening the pores of the aluminum and removing oxidation and impurities. Thin aluminum is repaired easily with propane or mapp gas, thick aluminum requires an oxyacetylene torch. Super Alloy 5 polishes beautifully and will hold a polish as long as the parent aluminum. Zinc rods that have no flux do not polish or hold a polish.